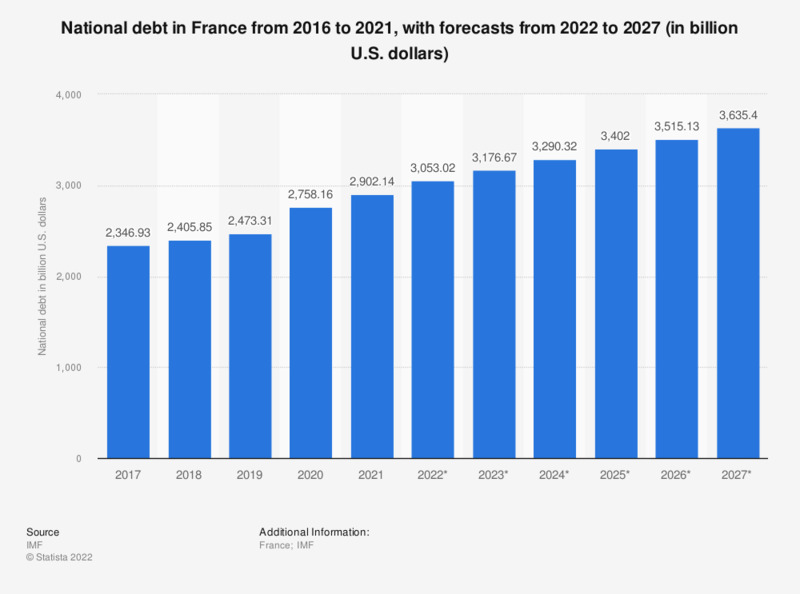 The statistic shows the national debt of France from 2012 to 2017, with projections up until 2022. In 2017, the national debt of France amounted to around 2.51 trillion U.S. dollars. For comparison, the Greek debt amounted to approximately 360 billion euros that same year. France currently has one of the highest national debt levels of any of the world’s nations. Debt in the European Union’s second largest economy is currently at around 97 percent of GDP. The cost of interest on the country’s debt alone comes in at over 1,600 euros per second; every man, woman and child in France, of which there are 65.3 million in total, take a share of just under 28 thousand euros of the debt. On the 6 May, 2012, the incumbent French President was defeated by François Hollande, leader of the French Socialist Party. The new President vowed to develop and change the tax system of France, announcing wide ranging economic policies in a bid to balance the nation’s budget and right what he considered to be social wrongs. He pledged and supported the separation of lending and investment banks, as well as proposing sweeping changes to the French tax system. The introduction of the measure of capping tax loopholes at a maximum of ten thousand euros per year and questioning the solidarity tax on wealth, the annual direct wealth tax on those with assets in excess of 1.3 million, were also part of Hollande’s proposals. The President has also signalled his intention to implement an income tax rate of 75 percent on revenue earned above one million euros per year. He stated the allocation of the revenue from this tax would be used to develop the deprived suburbs and to balance the nation's budget by 2017. France is a country brimming with big business and millionaires. The nation is home to the most millionaires in Europe; 2.6 million in total.